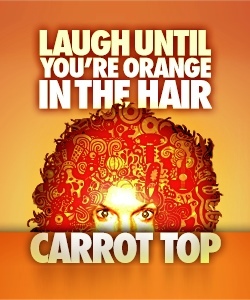 Carrot Top discounts - Hotels Etc. Carrot Top’s incredible imaginative performances and extreme style has made him a cult phenomenon. Famous for wacky props, crazy inventions and in your face energy, Carrot Top has been awarded “Entertainer of the Year!” and “Comedian of the Year” Describing himself as a culmination of George Carlin, Steven Wright and Gallagher, Carrot Top uses props like zip ties, duct tape, crazy glue, bow ties, paper cups, strings and more combined with observational humor, to keep his audience in stitches all night long! And now you too can hold your sides with laughter as the “King of Props” takes the stage at Luxor Las Vegas.